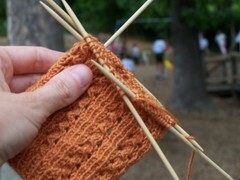 Fricknits: What Will the Neighbors Think? A couple of days ago, I was galavanting around my yard doing Important Blog Prepwork and noticed the neighbor girl looking at me a little funny. I tugged my skirt and did a little spin. Nope, no slip playing peek-a-boo. And this wasn't one of those days when I was chasing the Biscuit to and fro while sucking back a well-deserved Anchor Steam, so surely this wasn't a tsk-tsk sort of stare. But the neighbor girl, bless her heart, is painfully shy, and so I chalk this up to adolescent awkwardness and continue about my Business, nodding a friendly and (I hope) non-threatening hello in her direction. At recess today I whipped out Hanny's sock and zipped through four rounds without incident while enjoying the company of one of my student knitters who--get this--would rather sit and talk to me about knitting ("So there are yarnovers at the ends of the needles? How do you keep them from falling off?") than throw woodchips at the boy du jour. But then another teacher walked by and gave me that look again. Quick: Can I see all of my students? Check. No one is on the ground in tears? Check. Oh, well. Shrug. Maybe she's recovering from a nasty parent email. It seems to be that time of year. OK. Fine. You want answers? Here goes. 1. 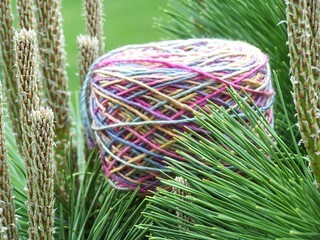 NO it is not "normal" to run about one's yard with a (drop-dead gorgeous) skein of yarn, nestling it into bushes and positioning it "just so" on pretty rocks. It's not. But little girl, normal will not make you giddy with happiness like a hank of Lion and Lamb will. 2. NO I don't want to talk about who dropped a pencil and a pack of Post-It notes out of the classroom window and onto some Kindergarteners and then told them that "God did it." I want to sit here and make something beautiful for my friend. Anyway, I know who did it, because they're in my class. They always are. 3. Little man, Mama just wants to work one more round of this Last Minute Purled Beret. Just one more round. I promise. And then we can go wash earthworms. Deal? 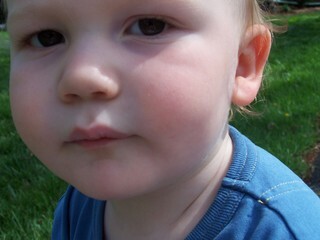 hi, julie - i love your blog - glad to read about this new beginning on the STR club KAL site. you left a comment on my own blog about some socks i just finished, and here are the det's: yes, it is STR cobalt bloom, and yes, it is fantastic. i did them toe-up, two-at-once, on two-circs, and used the "yarn over cable pattern" from the fab book "sensational knitted socks." thanks for asking. new str club package should be coming soon - i can hardly wait! when i was a teenager i was so concerned about acting normal that it took years for me to realize that the most fun i had was when i wasn't acting normal. Ooh, my sock! I see it! Nuts to teachers giving you looks on the playground. They are jealous because you are a hot mama knittist and your students would gladly thrown themselves into a pit of razor-sharp Post-Its for you. Just wanted to comment and say that I love your site!!! Your pictures are lovely. Good luck with the Green Gable. I am almost done with mine and can't wait to wear it!!! What *is* that orange sock??? I MUST have it. ;0) Love your blog and the playground story. HA!!! hahahahahahahah!! ha! "god did it!" hahahha!! my stomach hurts!